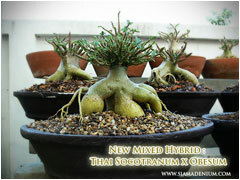 Today I would like to share you the new trend of Adenium form compatible with Bonsai Class. 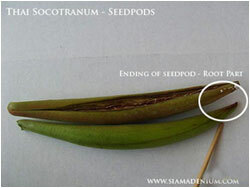 The most attractive of this Adenium 's style is spread root base. it's also consist of short neck, antique skin, and symatric branch comes up with strong middle branch and surrounding side branches. This style will be beautiful in Bonsai Pot. Please see the image below. 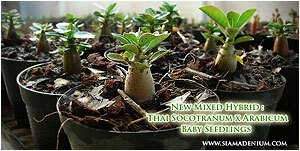 On the left photo shows the baby seedlings grown from mixed hybrid between Thai Socotranum and Arabicum. Her characters is different from Thai Socotranum and Arabicum themselves. Seedlings form has big base and many buds or tiny branches on top. Black Pearl, seeds on Thai Socotranum as mother. 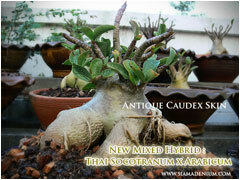 Thai Socotranum itself mostly has high caudex, please see the left photo. Arabicum has wide caudex but branch is hardly compact which most branch will get longer and hard to stop because this is nature of it. 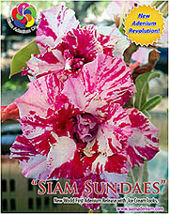 As I said, the hybrid knowlege is the most important to create the great Adenium Form. 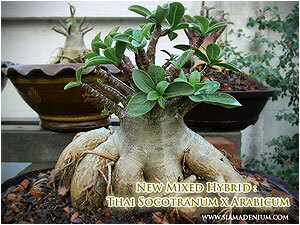 From now on, I have found new mixed hybrid between Thai Socotranum and Arabicum is perfectly matched with Bonsai class especially with "BOOM" style. Here below is my collection get from this new mixed hybrid. Please enjoy ..